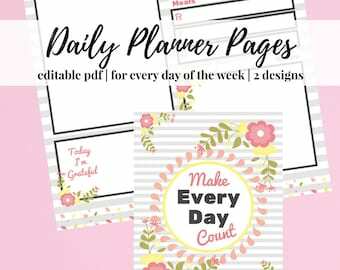 Fully editable undated weekly planner with additional password organizer, mini-address book and notes pages. Do you like your week to start on Sunday or Monday? No worries - both versions are included here. 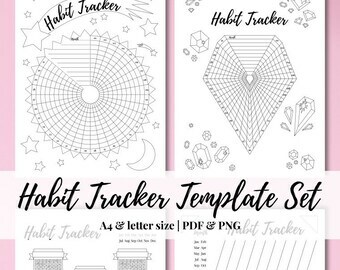 You can print it out or use it digitally - whichever way you prefer. 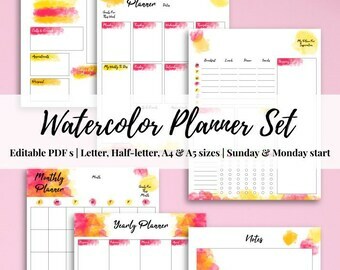 What else should you know about this planner? 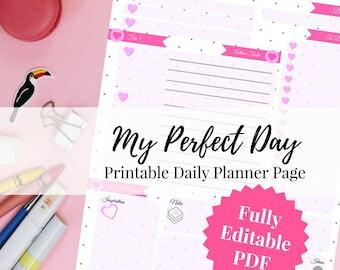 Vertical layout with a week on two pages - compact design with loads of space to write down all the things you might need. 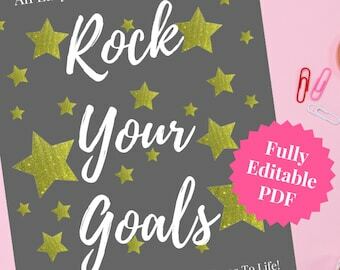 To stay productive and get the work done there are weekly goals, urgent/important tasks, top 3, and to-do sections. 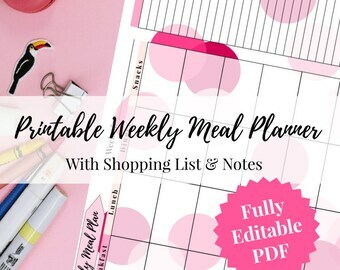 A meal plan (3 meals plus snacks) helps you be a smart and savvy cook, while a habit tracker will assist you in forming or maintaining a desired behavior. You mustn't forget to take care of yourself! Therefore, there are just for me and well-being sections. 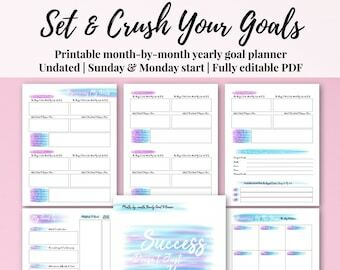 There are also password organizer, address book, and notes pages which - when combined with weekly pages and a front and back cover - can make a planner to suit your exact needs. This a digital item, and as such no physical product will be sent to you. 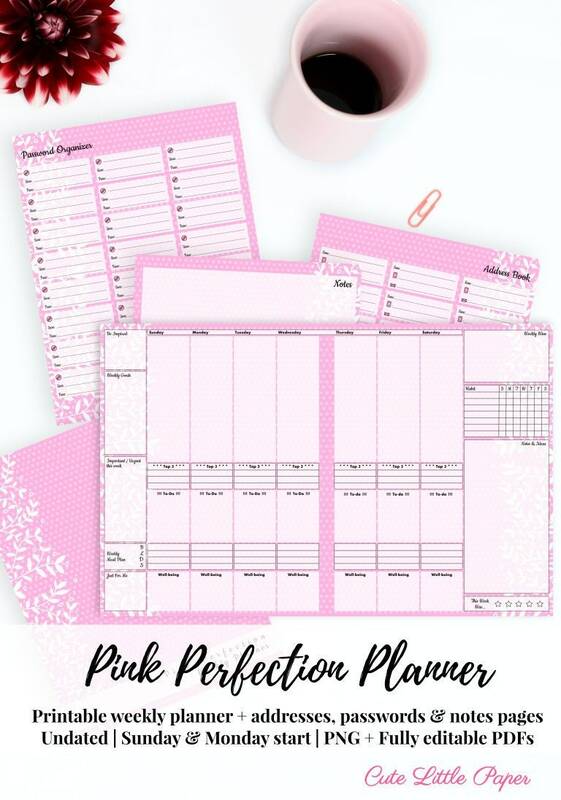 - png files of both Sunday and Monday start Pink Perfection Weekly Planner. NOTE: you need to have a software to unzip and access these files. 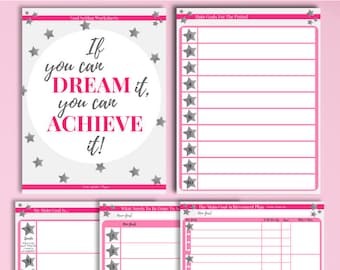 Weekly pages, passwords, addresses, notes, front and back cover are created as separate editable pdf files for an ease of use. 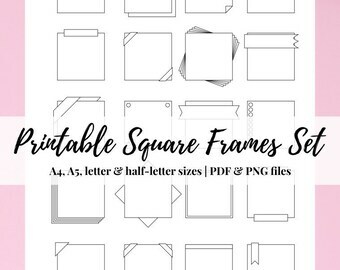 Designed to fit letter sized paper, but you can choose different printer settings and scale it down and/or resize to meet your needs. Once your payment is completed, the digital files will be available for download. Depending on your monitor and printer settings, colors might show slight variations. This item is for personal use only. You may not claim these graphics as your own. Due to the nature of digitally downloaded products, I do not accept returns or offer refunds. If the file is corrupted, please contact me immediately, and I will resend a corrected version of the file you purchased. 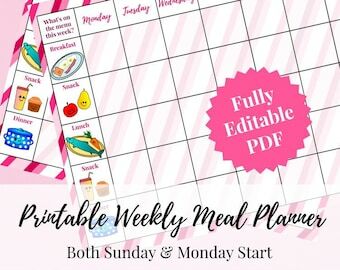 Printable Weekly Meal Planner with Shopping List and Notes - Fully Editable!